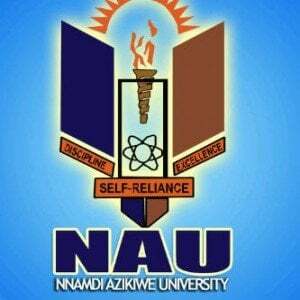 Nnamdi Azikiwe University, UNIZIK cut off mark for the 2018/2019 academic session admission exercise. If you scored exactly or above UNIZIK cut off mark, that means you are qualified and eligible to take the Post UTME screening exercise, and getting marks below cutoff means you are not eligible or qualified for UNIZIK post UTME. Nnamdi Azikiwe University, Awka is a Federal university in Nigeria. Its main campus is located in the southeastern part of Nigeria in Anambra State’s capital, Awka, and a second campus is at Nnewi. It is one of twenty-five federal universities which are overseen and accredited by the National Universities Commission. The university is named after Dr. Nnamdi Azikiwe. The management of the Nnamdi Azikiwe University (UNIZIK) has released the cut-off mark for the 2017/2018 academic session admission exercise. Comment Text*please I scored 229 in jamb and 47% in post utme I applied for history and int’l studies, I’m going to gain admission into Unizik?? please what is the cutoff mark for Med lab science? I scored 253 in jamb nd 34 in post utme wit a good results in my O’level 5b’s nd 3c’s will i be get admission to study business administration in unizik, Pls I need answer. Pls I scored 250 in jamb and 37% in postutme do I have any hope to study biochemistry in unizik? Please I got 204 in jamb and 48 in post utme exam, please is there any hope for me? Pls,, I scored 288 in Jamb ,, 64% in Post utme… Going for Computer Science.. Whats the Cuttoff Mark???? Plz I scored 233 in jamb and 40 in post UTME I applied Biochemistry will I be admits? if i score 224 in jamb and a 36% on the unizik ume exams . to study computer sci ..it there a chance of me gaining admission.